Published by Cyril Huze December 15th, 2016	in Builders, Customs and Editorial. 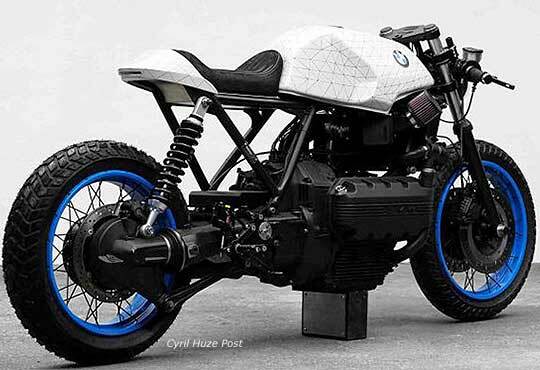 The BMW K100 was a family of four-cylinder 987 cc motorcycles that were manufactured by BMW from 1983 to 1992. Quite ugly if you ask me. But at the time featuring some nice refinements including aluminum fuel tanks,, adjustable headlights, high capacity 460 watt alternators, Hella accessory plug-in, and self-cancelling turn signal lights. This one is a 1985 model fully re-engineered and handcrafted by Philipp Wulk and Matthias Pittner aka Impuls from Germany in collaboration with artist Fabian Gatermann who scanned the model in 3D and re-designed the frame and bodywork for a very nice and modern naked look. The flying brick, lots of times things become more popular once you can no longer buy them. What is also (a liitle?) cool is that this is probably the closest you’ll ever get to owning a longitudinal 4 cylinder, even tho they are laying on their sides..
It’s nice, I would love to play around with some of these bikes someday but engineer a mazda rotary motor like Rodney Aguiar’s Revelation… I wouldn’t shoot for as much power as he did though, a stock port would still fly in a bike,,, wouldn’t be able to register it in Australia either but man, it would be some fun…some headaches to build too but rewarding, not everyone’s cup of tea but I prefer the rotor motors. Super clean build by these guys though… classy! All in all it’s just another brick that’s too tall. Shoot! I transformed an 86 K100RT last year and just knew I should’ve forwarded images and the story behind it to you Cyril. That’s what I get for snoozin’!